Will Thailand take leaf out of Asia's book of change? Editor’s note: Matt Stumpf is the Washington director of Asia Society and the Asia Society Policy Institute. The opinions expressed in this article are solely those of the author and do not necessarily reflect the views of Asia Society or the Asia Society Policy Institute. As “change” elections and momentous transitions sweep Asia, Thailand has self-selected for stagnation. 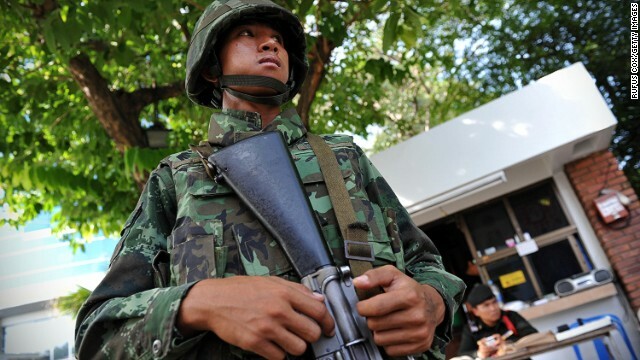 Tuesday’s action by the Thai military to declare martial law while leaving the government in place continues the perpetual crisis the country has lived with since the coup that ended Thaksin Shinawatra’s government in 2006. Across Asia, public calls for a sea change in governance have brought to power new leaders with a wide range of views but a common imperative. From Narendra Modi in India to President Thein Sein in Myanmar, Prime Minister Shinzo Abe in Japan, Indonesian presidential front-runner Joko Widodo, and even President Xi Jinping in China, today’s Asian leaders must promise to install reformed, more accountable, and effective governments in their countries. These leaders face headwinds in challenging political and economic environments, but know that public support is premised on their ability to lead more adept governments to deliver new prosperity. There is no such voice in Thai politics, and the country is falling behind dramatically. The Wall Street Journal reports that Thai consumers are the most pessimistic about the economy that they have been in 12 years and that Thailand’s economy has shrunk 2.1 percent in the first quarter of 2014, compared to the fourth quarter of 2013. Even before the declaration of martial law, the Thai stock market was down 15 percent over the last year. Fitch Ratings have said that the failure to resolve the impasse by mid-2014 would lead to a downgrade of its sovereign rating. Tourism, a key driver of the Thai economy, is already off 5 percent for the year. This week’s news might even worsen the picture.